What do they look like as adults? Picture comparing an adult size to something familiar! Color & coat are directly linked to the DNA of the parents. Defining the so-called “Teddy Bear face”! Upkeep of the Schnoodle coat. 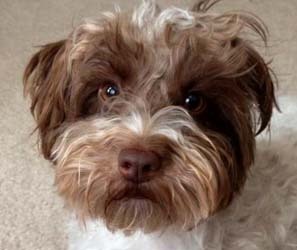 WHAT WILL A SCHNOODLE LOOK LIKE AS AN ADULT? Two questions I am frequently asked about the Schnoodle concern size and facial appearance. A Schnoodle is a hybrid, a first generation cross between a purebred Poodle and a purebred Schnauzer, combining the best of both breeds. 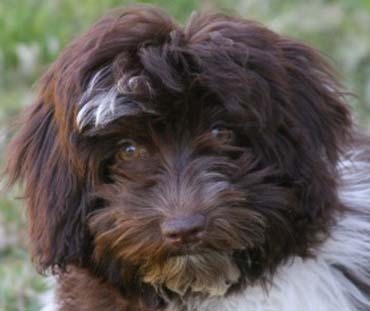 As illustrated in the photos below, Schnoodles have a similar overall appearance or look – but are variable in size and color. I believe the Schnoodle looks more “Schnauzer-ish.” The breed standard for the Poodle is a “square”, meaning front leg to top of shoulder will be almost the same as shoulder to tail. The standard for the Schnauzer is longer back with shorter legs. Where the Poodle has the “prance”, the Schnauzer has the “stroll”. The combination of FIRST generation is always the same in appearance. 1. Height and agility from the long legs, as well as endurance (easily walking 4-5 miles a day). We have one client with an 8 pound dog that routinely walks 5-10 miles! Puts me to shame! 2. Smarts? The Poodle is #2 in the canine world. This is quickly apparent by how fast and easily they train. 3. A thicker coat without the tight curl. 4. A strong sense of loving behavior toward the owner. 1. A longer back and ears set higher on the head (they talk with their ears like the Schnauzer—you won’t catch a Poodle moving its ears!) 2. Smarts. The Schnauzer is #9 in the canine world. 3. A loose wave in the coat that for some reason does not seem to mat (don’t ask me why?) 4. A strong sense of loyalty. They are incredibly “laid back” waiting for you to suggest what you want to do next! These observations are from 18 years of experience breeding the FIRST generation Schnoodle from the purebred Poodle & Schnauzer. The result is ALWAYS the same. SCHNOODLE COAT I can appreciate that it is hard for you to picture a week old pup as I am describing it to you over the phone. Classic characteristic is a “wave” in the adult coat. I call it the “Schnoodle wave”. 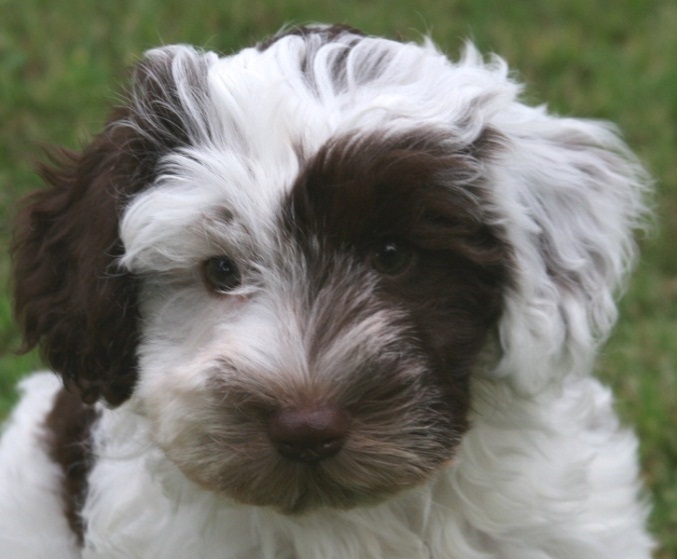 A true FIRST generation Schnoodle will ONLY have a wave, NOT curly and NOT straight. 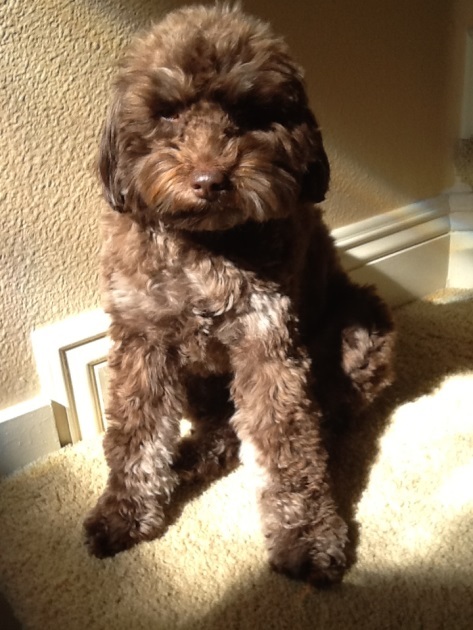 If you have seen a dog with a curly coat, chances are it is “more” than ½ poodle thus, NOT a Schnoodle! Perhaps there is some Poodle, some Schnauzer and some of something else! Common sense must tell you that when you take a curly poodle and cut that “genetic curl” in half the result MUST be a loose wave. This is the case with every First Generation Schnoodle. You can see from the photos that the faces are the same. 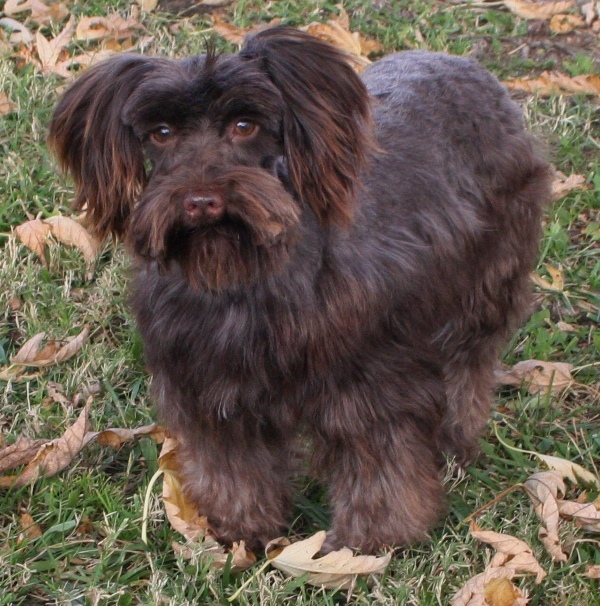 Buyers regularly describe a Schnoodle as a curly dog with a flat face. Nothing could be more untrue as the following photos will demonstrate. You should not judge your puppy by the coat you see in the baby photos on the internet. These photos often follow a bath and blow dry so puppy is very fluffy and the coat appears straight. You may overlook this pup but you shouldn’t! You won’t see the adult coat until about one year of age and it will be wavy! 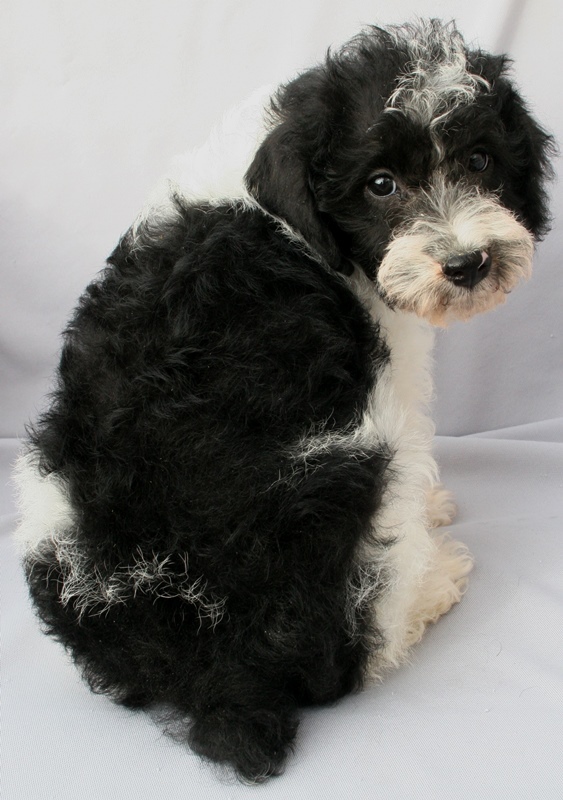 I have never had a buyer report that once their Schnoodle was mature the coat was a wiry straight coat. Adult photos buyers send me of their puppy all have a lovely wavy coat. 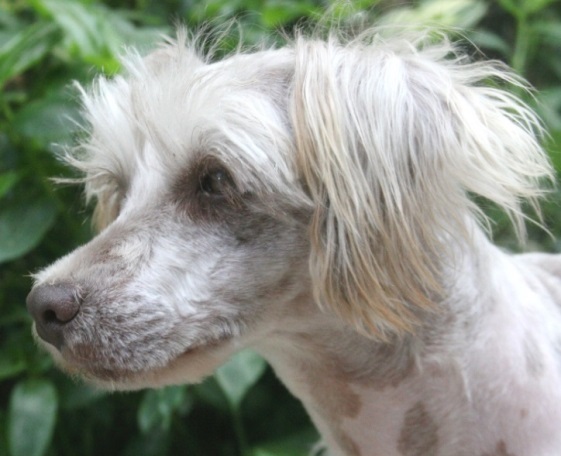 There are many photos of this site of adult Schnoodles. They also have different haircuts that show them off. Haircut and length of hair makes a big difference in the “look”. Women know that when they blow dry their hair it is straight, also the longer you grow natural curly hair the weight often changes how much curl is evident. Look up photos of competition show Poodles. The coat is long and blown/brushed straight. 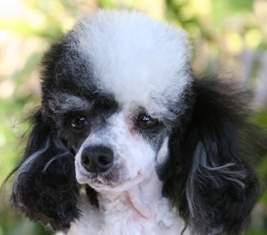 In fact you can’t (and shouldn’t be able to) find a bit of “poodle” curl on these dogs! In the case of my dogs, I can attest to is the lovely soft coats on my Schnauzers. Many, if the coat is left to grow long, have a lot of curl. That is the quality of my dogs so, of course, I can expect a lovely coat on my babies. Buyers typically have two criteria; their puppy must be oozing with personality, smarts, and outgoing behavior plus have a soft curly coat, and definitely not the wiry coat of the Schnauzer! I have already addressed the personality of the Schnoodle and now it is time to put to rest the odd assumption that all Schnauzers have a coarse wiry coat! These descriptions make me think of a brillo pad or a wire brush used to clean the bar-b-q! The buyers that make this statement have never handled a Schnauzer or Poodle, but are basing their opinion on photos or perhaps an Internet description. However, “seeing is believing”. Below are photos of some of my Schnauzers. 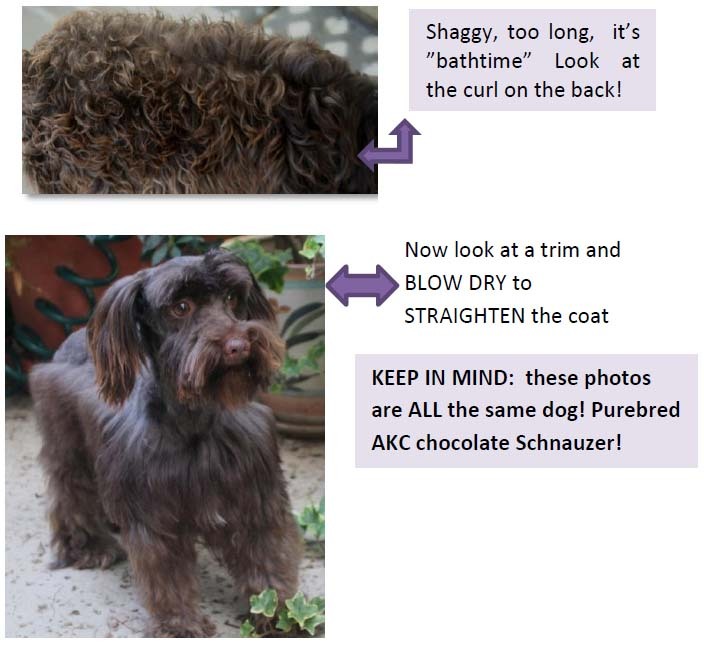 The up close examples of coat clearly show an abundance of soft wave/curl. Remember you are looking at purebred AKC Schnauzers. It is time to dispel the theory that ONLY Poodles have a soft curly coat and Schnauzers have a nasty wiry coat! 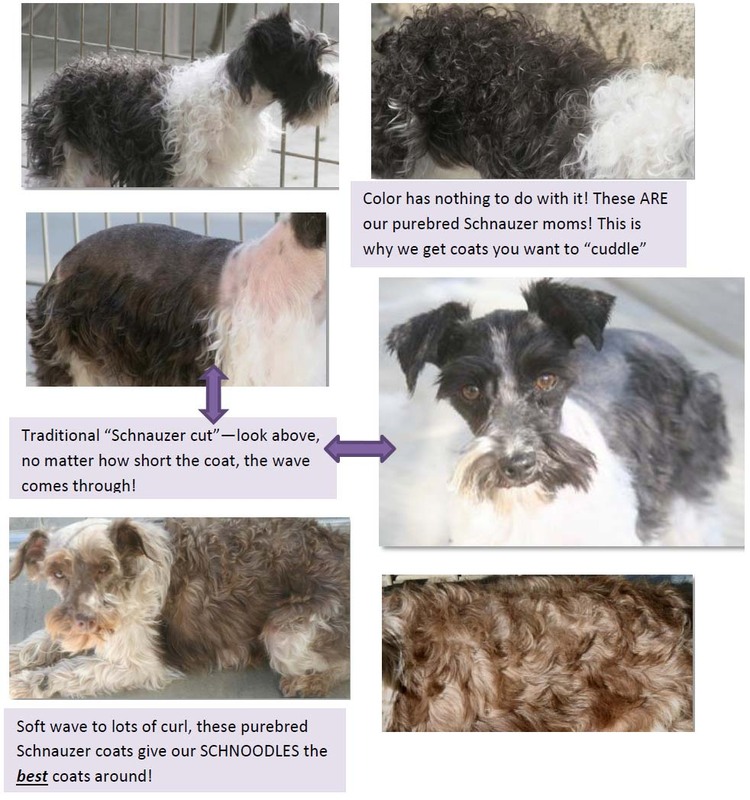 Here is proof why MY Schnoodles have soft, “finger caressing” coats that “border” on curly! 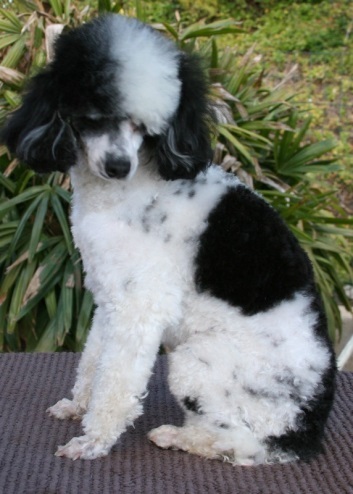 If you want a super “curly” coat then consider the purebred Poodle. Otherwise, wanting a Schnoodle means one thing, a soft coat with a “wave”. 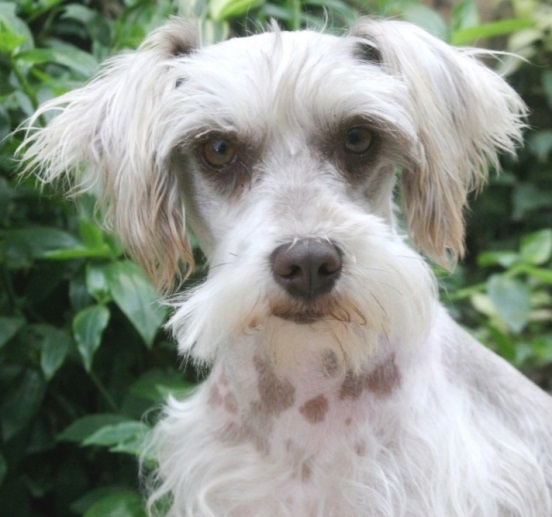 I have found that many people thing Schnauzers don’t have a snout. SO I shaved the face of my Schnauzer to prove a point! What “IS” different between the breeds are their ears. 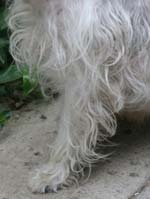 On a Schnauzer, the ears are higher and the Schnauzer uses them to “talk with” or express itself. When talking to the Schnauzer, the dog quickly moves its ears up and down, one then the other, sometimes both at once. Now that you know how the ears play a role, you can easily see the “relaxed” Schnauzer ear look and tell which photos were IN response to me talking to them! NOW it’s the Poodle turn! From “I don’t know what breed you are” to the classic poodle cut! 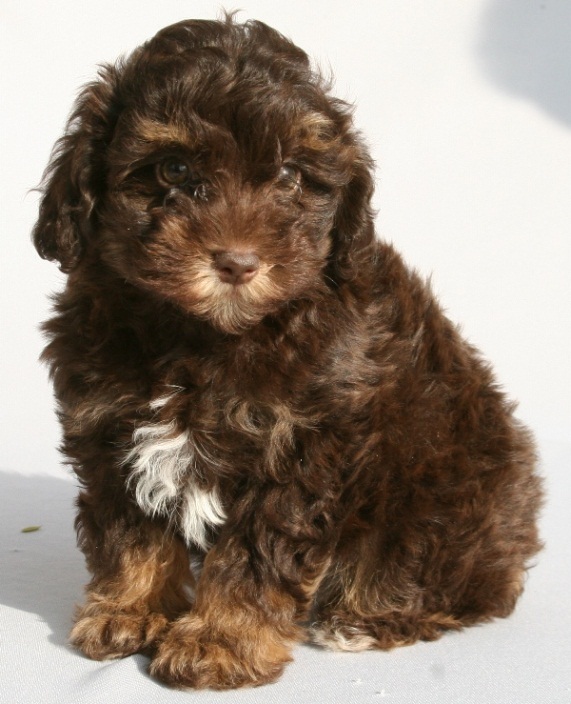 SO WHAT EXACTLY IS A TEDDY BEAR SCHNOODLE? I am often asked about pups with a “teddy bear” face. 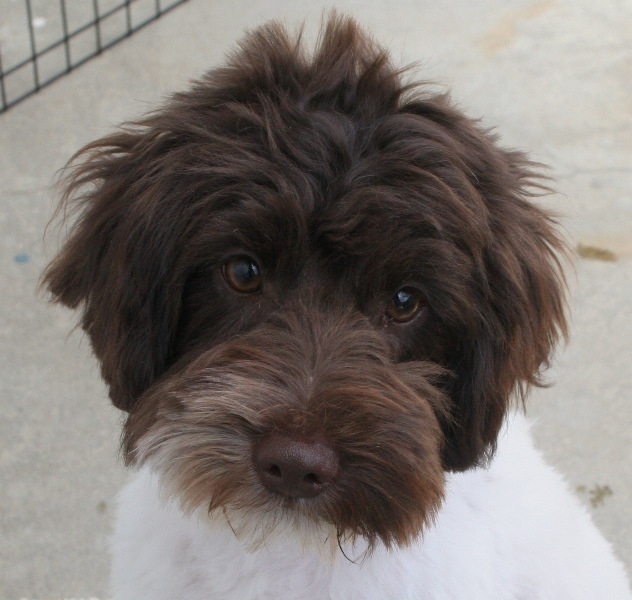 When questioned, clients invariably describe this look as a short-nosed fuzzy-faced dog. 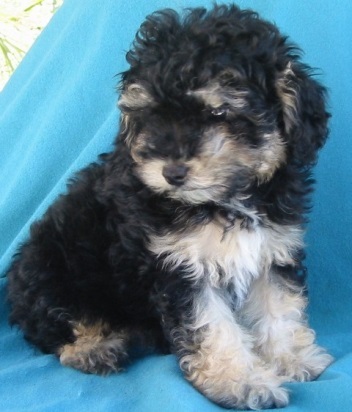 BELOW PHOTOS ARE ALL 1st generation SCHNOODLES! 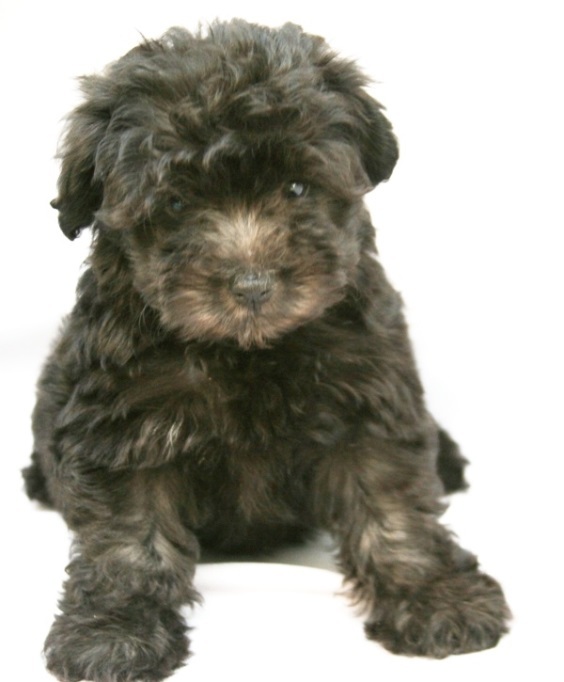 A well-bred Schnoodle can’t help but look like a TEDDY BEAR! Coming in all colors, including a perfectly balanced body! A correct Poodle is a square dog, perfectly proportioned in height and length, with an oval-shaped head and slightly almond-shaped eyes. In contrast, poorly bred Poodles often are long backed and short legged, with round goldfish-like eyes and a short snout. “TEDDY BEAR” refers to the haircut NOT the structure of the dog! The expression “teddy bear” originated in the Poodle world. 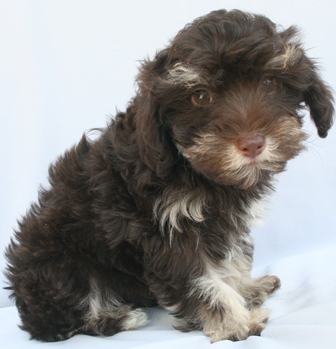 The term applies to puppies with a particular look, but a look that is NOT to the poodle standard. 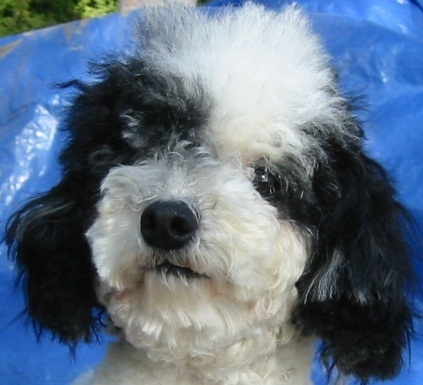 Sadly, serious Poodle breeders are less common than backyard Poodle breeders, and over time, poorly bred puppies have become what many think of as a proper Poodle. Here are the basics. To sell these pups, breeders invented “cutsy” names – names that would make the buyer think they were getting something special. Thus, the term “teddy bear” – something that everyone has owned and cuddled. This is a sad commentary on an elegant breed, but the “teddy bear” thrives and is now synonymous with a square fuzzy face that many people find attractive. We specialize in “unusual” colors. This is no accident! Long before I was breeding Schnoodles, I was breeding purebred Poodles & purebred Schnauzers. There are “common” colors in both breeds. The most common seen Poodle colors are white, cream, black, and silver. The Schnauzer breed is solid black, solid white, black/white or salt/pepper, a combination of gray in two-tones . These dogs usually have generations of these same colors. This explains why when you breed a white Poodle to a salt/pepper Schnauzer you will get a litter of mostly steel gray pups. Now let’s examine the genetic factor that produces the “uncommon” colors. There are also less common colors like red, brown, black & white or brown & white Parti which means two colors on the same dog expressed in a pattern. With Parti pups, NO two are ever the same. That in itself is unusual! Next, we have the brown/ivory or the black/silvery-white Phantom. The Phantom colors are similar to that of a Doberman. They are not random, but exact: the lighter tone is up the inside of the legs, under the tail, across the front, under the eyes down to the nose and always upstaged by eyebrows! All these “uncommon” colors are the result of what we call the genetic factor. This means BOTH parents must have these genes. My dogs have six or more generations of multiple colors. This is why a brown mother bred to a brown& white Parti dad can produce a litter with solid brown, brown/white Parti, black/white Parti and even a Phantom! It is like opening a box of chocolates. Records are kept so we can track what combination of parents produce what colors of puppies. Brown is a rich unusual color and a favorite with buyers. It is little wonder then that we try to plan our breeding to produce a greater number of brown pups. You will find examples of “uncommon” colors featured throughout this site. 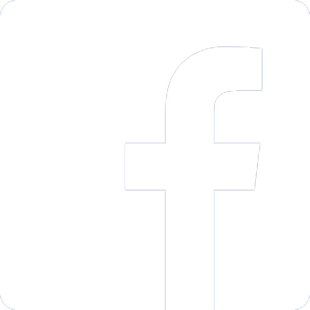 Check out the HEADERS on many of the pages. I always try to help buyers see what I see! To do this I want to FULLY describe the color “BROWN”. 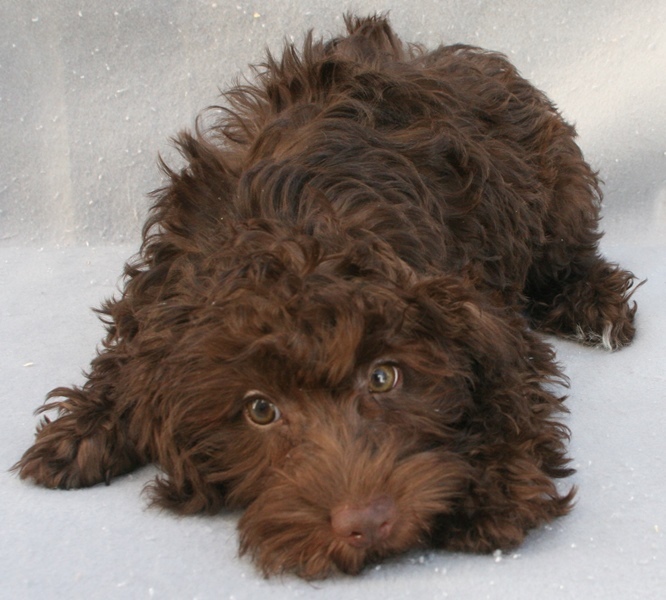 Brown is a recessive gene, and very easily influenced by the other genetic color factors in the pup. Because our breeding stock is Parti (2 colors same dog) for 6 generations we have many factors that can give us different colors within the same litter. At birth brown pups are so dark we use a flashlight to determine that it is not black but brown for our records! I have seen brown pups mature into every brown tone you can imagine from the golden brown like a pretzel to a gray/brown like cocoa, and some have two different browns on them. My Schnoodle has a dark brown head complimenting a soft gray/brown tone body while my Poodle has a dark brown head, brown legs and a light brown body. I have seen pups stay solid brown through their adult life. POINT IS, you never know. 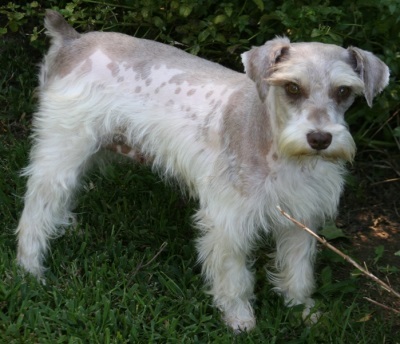 Also the Schnauzer breed has a brown two-tone that is known as Liver Pepper. This is a mixture of brown and a version of dark gray/brown. It can show as a “blanket” of brown on the back of the dog with the legs being the lighter gray/brown to cream tone. Try to understand that the time of day, location, amount of sun or shade ALL contribute to how the color is perceived in a photo I post or may send you. Also, your computer monitor is probably not color profiled to show color accurately. Most people don’t have “photo color monitors” like I do. I post photos that are accurate on my computer BUT can have a different “hue” on yours. We take all photos outside to best maximize the use of natural light for color accuracy. Fact is, after many years of producing versions of brown, I must say that 95% of the browns have an amber to honey color overtone as adults. THIS IS A MUCH LIGHTER VERSION than that of the wee pup. Also we commonly introduce black to “hold” colors. Brown is always brown, it won’t change to a totally different color! Hopefully I have added to your knowledge of “brown” dogs. 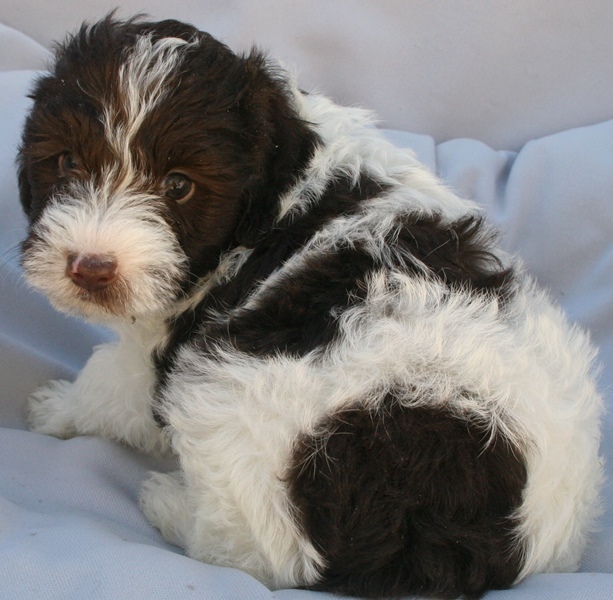 DO NOT THINK that you will have an adult Schnoodle the color of a chocolate Lab or Irish Springer. Those breeds have been solidly color mated for years and thus the elusive “recessive” brown gene is as good as it gets! EVERY PUP/ADULT YOU ENJOYED ON THESE PAGES is a breeding result of PUREBRED AKC DOGS FIRST GENERATION ONLY. Research your choices! A Schnoodle does not shed! This means that hair must be taken off the pup at certain times. When you first get puppy it will be fluffy, and you will think you always want puppy to be this adorable! 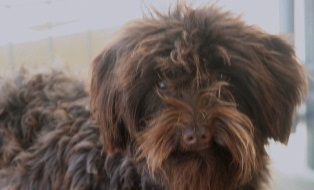 Between the ages of 3-4 months, however, the puppy coat will begin to look “scraggly”. This is because the new coat is starting to come in. The puppy coat should be removed to allow for the healthy growth of the adult coat. 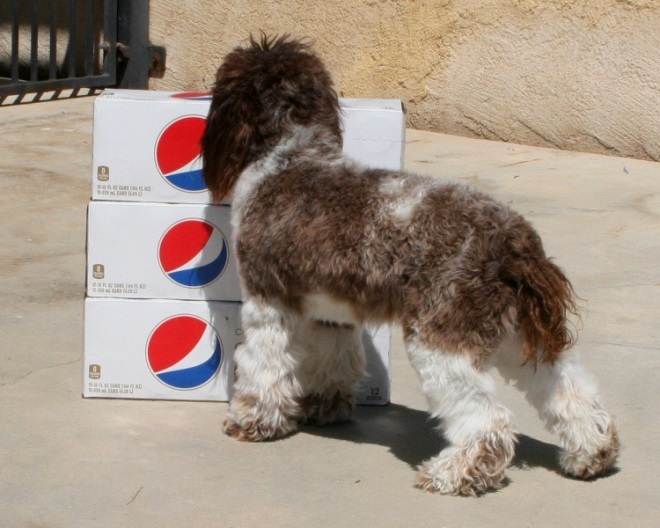 OUR PUPPY PACKAGE outlines how to “DO IT YOURSELF”! Puppy cannot go to a groomer UNTIL the last shot is completed at 16 weeks. This is one of the reasons I want you to know how to do a “basic trim” on your puppy. Long before 16 weeks you will wonder where the eyes went! We prepare you for that!